A 'Tough Decision': Puerto Rican Governor Says Island Will Miss Debt Payment : The Two-Way "I've decided that your basic needs come before anything else," Gov. Alejandro García Padilla said, adding that he will not close hospitals in order to pay the island's debt. 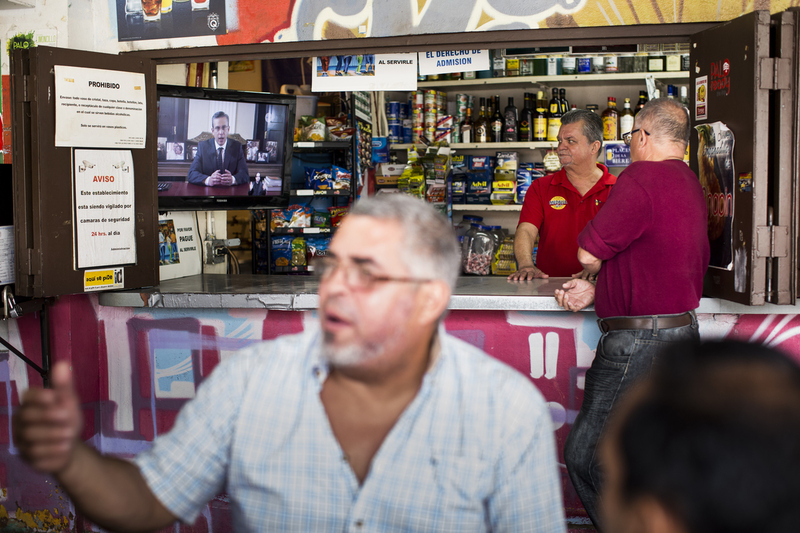 A barman and a customer watch Alejandro García Padilla, governor of Puerto Rico, giving a speech on a television screen in a bar in San Juan, Puerto Rico, on Sunday. Saying he was making a "tough decision," Puerto Rican Gov. Alejandro García Padilla announced the island would not make a more than $400 million debt payment due today. "I've had to choose and I have made a choice," García said in a message to the commonwealth. "I've decided that your basic needs come before anything else." "Much of the money is owed to big U.S. investors including hedge funds and mutual funds. Puerto Rico has been trying to persuade Congress to pass a debt restructuring bill without success. "The island has been suffering through more than a decade of economic stagnation and population decline, and García has called the debts unpayable." In his speech, García said Puerto Rico was facing the "worst financial and humanitarian crisis in its history." He said that it is facing making a choice between providing its citizens with health care or paying its debt. "The situation is so difficult that we can barely cover the costs of providing services to special needs children," García said. "We're struggling to pay the gas needed for our police and fire department vehicles." As the Wall Street Journal reports, a recently enacted law allows the Puerto Rican government to forgo debt payments to instead pay for essential services. "The [Government Development Bank] is continuing its discussions with creditors and said in an announcement late Sunday night that some creditors have agreed to hold off on lawsuits while conversations continue. The parties are discussing preliminary terms for restructuring some of the GDB's outstanding debt, including a plan that would reduce some debt obligations by roughly half. "Some lawsuits are already in progress. Last month, a group of hedge funds that own GDB bonds filed a complaint in federal court asking that the GDB be barred from allowing the withdrawal of funds. "Puerto Rico owes investors about $70 billion in total and is reeling from 10 years of economic stagnation and population decline. The island began defaulting on debt in August, but there have so far been no defaults by the GDB, which provides liquidity to Puerto Rico's government agencies."